First up, we have "Spear of Heliod," one of last two previously unspoiled God weapons. Now, we just need to see that whip. As God weapons go, this one is a bit underwhelming, but seems to pair well with Elspeth. We'll have to see how it plays out. 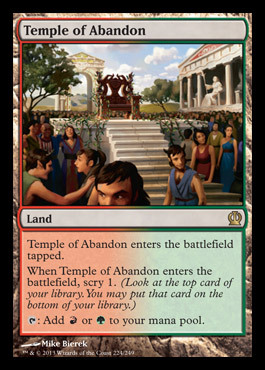 Many of us were waiting on speculating on what type of dual lands WoTC would give us in Theros, and they have arrived. 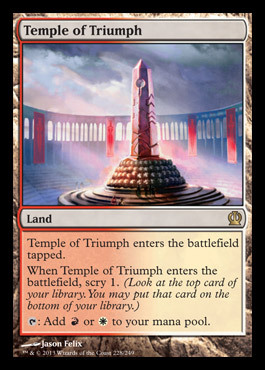 While the jury is still out about how impactful and powerful these lands are, I'm definitely excited to playtest them. So, several things to talk about with this group of cards. 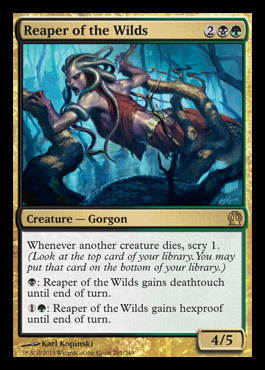 First of all, we see a functional Searing Spear reprint. I guess Wizards didn't want to confuse it with the Spear of Heliod. Oh well - 3 damage at instant speed is playable, regardless of the name attached to it. I guess the only confusion at this point is: when to play this over Magma Jet? Next, we have a strict upgrade to Murder with Hero's Downfall. Instant-speed Planeswalker removal sure is enticing. 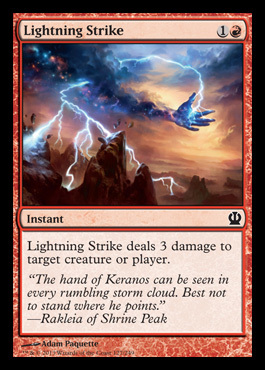 Steam Augury seems really strong, as does Prophet of Kruphix. 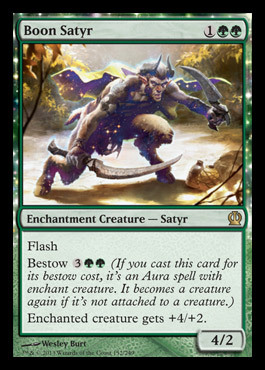 And while Ashen Rider is a bit too expensive for a standard without reanimator, I hear it'll see some play in other constructed formats.